We’d been planning to celebrate my birthday since last month, and it was only today that we finally made it. After hours of contemplation on where to eat, we thought we would step out and decide at the spur of the moment. So we drove down to Sa kinaka, which is now abuzz with a handful of good eating haunts. There, just a couple of mins ahead of Times Square building, the bright red board of “Kakori House” attracted our attention and we’d made our decision. Kebabs it was!!! They have vallet parking, which made our parking job easier. The place is small but well managed with closely arranged tables. The ambience hits a 3 out of 5. The “Burrp Popular Award” on one of the walls was attracting our attention. They also have 3 branches in Mumbai. Service is super-fast, staff is friendly. We’d ordered for Kakori kebabs, Galauti kebabs, roomali roti, warka paratha, chicken dum biryani, chicken korma and phirni. Food hits a 6 out of 5 here. Kakori kebabs are melt-in-your-mouth. Super!! so much so, we went for seconds. They reminded me of the ones I’d savoured in Falaknuma in Lucknow. Galouti kebabs were yummy but not of the consistency they ought to be. Roomali rotis are made of wheat. Biryani was silky and the aromas of the spices lingering in the mouth. The food was a true Lucknowy affair. We were basking in the glory of the main course, when the dessert – phirni, was a major turn-off. It was served in a plastic container, something like a take-away. I am a die-hard phirni-fan, so seeing my favourite dessert being insulted like this, put me down. Also it was more of a custard than a phirni. Else, everything was more than pleasing to the taste-buds and the tummy. 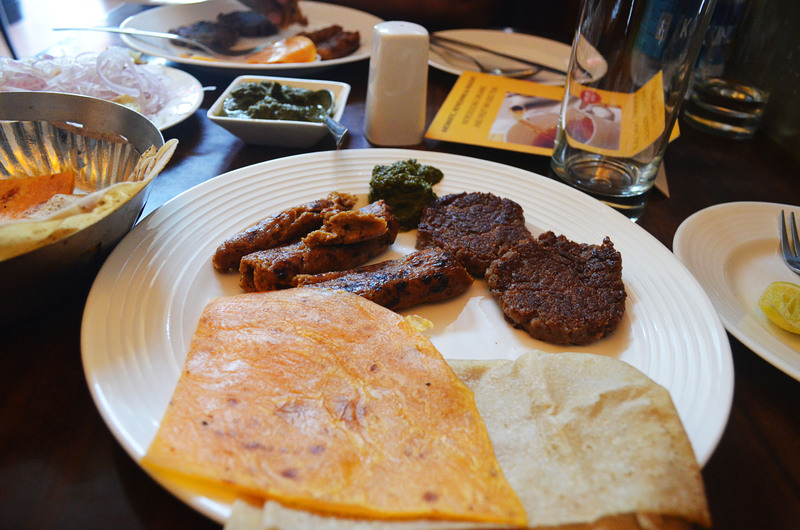 I feel, I’ve found Lucknow here in my own Mumbai where I can savour my kebabs anytime I want. Thumbs up to Kakori House!! !